Not sure if I'd want PvP/co-op in this game yet or the ability to leave messages, I know a lot of stuff will be similar to the souls series but since its a new IP having the same sort of mechanics would be a tad disappointing I'd rather they went all out and surprised everyone. I want it to similar to Souls as I can't play souls in till it comes to PSNOW and by then hopefully this will be out. From Software want to have this out for early 2015, Q1 early. So March 2015 I'm going for, looks a good start for PS4 next year. A March release would be nice though but I fear this could clash with Monster Hunter 4 Ultimate not that they'd affect each others sales I personally just wouldn't want to have to choose between which one I'd have to buy. CVG, IGN, GT, I could go on. Well you would need a ps4, so I think your more likely to pick up monster hunter. That's the thing I trust From Soft to deliver a great game so I'd happily buy a ps4 for this (if I don't beforehand) which means MH4U could take a back seat if they arrived on the same day. Have you checked out the gamescom thread. I'm hearing from Japan that Sony want this out ASAP due to the PS4 not doing so good over there. New trailer & details on the combat system. EDIT: That regain system is very interesting & I see it being a real tug of war especially in boss battles, oh also was that a playable female character talking at the end of the trailer? Also the game looks absolutely brilliant visually. It looked good from the trailer and nice to kinda get a release date window. The main guy behind this reckons no one will beat the demo of this on the show floor at TGS and anyone who does will get an amazing prize, the sales team that will be there on the floor can't even beat it. Sorry to triple post but people in the EU are getting Alpha invites, so far people select have all platinumed a Souls game but you can try to get in here. Aye I heard about that from someone on skype earlier, also that link just takes me to a psn sign in page Mas & then it tells me I don't have permission to access the page. EDIT: Never mind it worked when I tried via a link from an IGN article, here's hoping I get selected. Apparently all Souls games, from the IGN article. I honestly don't know if I buy that criteria, also do we even know how the online elements work in this game yet? As fun as the souls online can be I'd like to see something new for bloodborne. I didn't think we would see it in February due to The Order coming out then as well, seems a little mad to have two first party titles, so close together but also makes me think what's Sony got planned for the rest of 2015 apart from a few known games like until dawn & uncharted. I'm so glad with how different the game is sounding. From what I played at EGX and what little I've played of Souls, I could tell it would be different. Sadly this has been delayed until March 27th though it's for good reasons. We were gratified by the feedback and data we received from those who participated in our limited Alpha test. The extra production time will also allow us to better integrate these learnings. He also said to look out for exciting news in December. I'm not to bothered about this delay as like your quote says it's for reason and I'd sooner it came out when it's done not rushed out. And it's not like Sony needs the game PS4 selling fine with NO games and The Order is coming in February, so it's nicely spread out now these two games. December is the big PS4 event in Vegas. Along with a bunch of new screenshots there's info on new environments, characters and weapons in this playstation blog post. Here’s one more weapon you’ll be able to wield: the transforming cane. In its standard form, it’s a melee weapon for short range attacks. 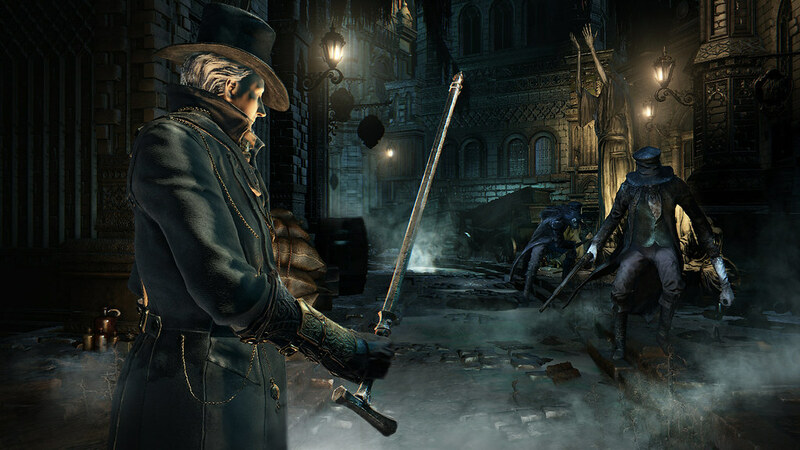 Like many of the other weapons in Bloodborne, however, this weapon can also transform into a deadly heavy or long range weapon as well, making it a devastating bladed whip. but by far the most interesting bit of info is that underneath the city of Yharnam there is a network of multi-levelled ruins that will be different to each player. Masofdas has said what I was thinking: there's no way Sony would launch this in the same month as The Order, and it seems like Sony would rather save their big releases to push PS4 sales. What's interesting is how Dark Souls 2 "next-gen" is launching very close to this. New trailer showing off the co-op.